A female figure holding the staff of Caduceus in a frieze over the doorway to a bank in Warrington, north west England. Caduceus is also seen as a symbol for the Deacons of pre-Union lodges in England. In Freemasonry, we are used to seeing and understanding our Masonic symbols, as taught to us in our ritual and our further studies. But symbols have been used throughout the millennia for many different Orders, religions, aristocratic families and indeed, for companies and organisations. 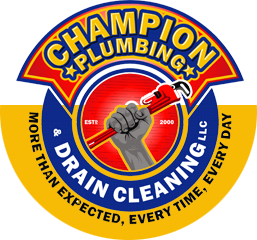 Here are a few symbols that I have come across on public and company buildings, symbols that are also used in Masonry. In England during the eighteenth and nineteenth century, certain symbols that were also used within Masonry became common on certain public and company buildings. The symbol of Caduceus for example – a symbol I have previously discussed in a past article here – became extremely common, and can be seen here above the doorway of a bank in Warrington and on the balcony of Liverpool Town Hall – a public building of local power built in the eighteenth century in a Palladian style. This building has seen a number of Freemasons pass through its doors while in public office, Freemasons such as Thomas Golightly and George Canning. The staff of Caduceus appearing above the balcony of Liverpool Town Hall. The symbols of the Cornucopia was also popular on banks during the nineteenth century, as seen on the present day Lloyds Bank in Corn Street, Bristol, which elegantly displays many symbols of trade, industry, wealth and power. The Cornucopia, being a symbol of plenty and of fruitfulness – and a symbol that appears in Freemasonry – became a fitting image for many banks. Before it became a Lloyds Bank, the building was the West of England and South Wales District Bank (photo from http://www.speel.me.uk/sculptplaces/bristolbank.htm). Many British banks reveal these symbols as part of elegant friezes on large imposing nineteenth century buildings in prominent places of the town or city, the building and its architecture being a statement of power and wealth. In Edinburgh, Scotland, the Cornucopia appears prominently on the Head Office of the Bank of Scotland, on top of and at the side of the coat of arms of the Bank of Scotland, above the main entrance. 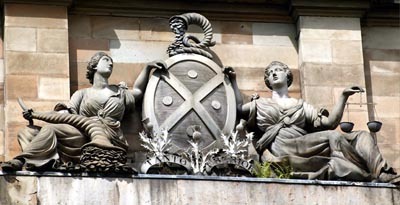 The twin feminine figures represent Justice, and the cornucopias are filled with money, the money over spilling (photo from http://www.lloydsbankinggroup.com/Our-Group/our-heritage/the-mound-edinburgh/). The Cornucopia displayed above the doorway to the current Lloyds Bank in Corn Street Bristol. The coat of arms above the entrance to the Head Office of the Bank of Scotland.